The new addition to the Keeley line is an homage to the mid-70s David Gilmour sound, resting comfortably in the classic Dark Side to Animals (even The Wall) period of the Pink Floyd guitarist’s work. As with Keeley’s recent Jimi Hendrix-inspired Monterey pedal, the Dark Side sports beautiful workmanship, low noise, a great layout and a cornucopia of features. There’s a lot to cover, so I’ll plug in a stock early 70s Strat (I had to for this pedal!) to a clean Fender-style amp and put the Dark Side into play. Richard Coibion was hit by the effects building bug back in 2001. With a background and education in electronics engineering and having a steady career in IT, Coibion dabbled in modifying fuzz circuits and tuned them to his liking. He hadn’t ever considered making a career out of building effects however. I have a confession. As a guitarist for well over 25 years, I had always been an “anti-fuzz” person. In fact, I can honestly say I hated and despised the sound of fuzzes that I had heard. I couldn’t understand the point of purposefully making a guitar sound as atrocious and “lo-fi” as possible in mind. A fuzz tone after all, sounded nothing like an electric guitar should. The Maxon OD-9 leads off the 9-Series of pedals and in fact looks just like the original Ibanez TS-9 tube screamer. There’s good reason for that since Maxon is actually the manufacturer for the classic effect – look inside a TS-9 on the circuit board and you’ll see the Maxon name! 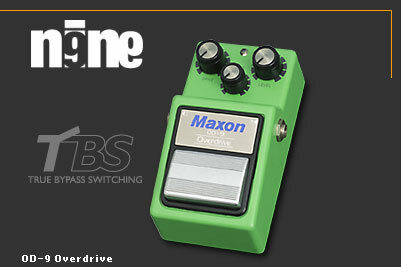 So let’s dig in a bit more and see what’s new with Maxon’s own OD-9 Overdrive. The Bixonic Expandora EXP 2000R is a unique looking pedal, with a novel approach and style that sets it apart from today’s invasion of new overdrive units. A reissue of the original Expandora 2000, the new unit incorporates some new sounds and design updates from the original. Within the confines of its sturdy housing, it contains a broad palette of sounds for the player looking to sample some different flavors of overdrive without having to commit to the cost or space of several individual pedals.